The Saint Louis Show Me Classic was held this past weekend, August 5th & 6th. We had pool play, before all fourteen teams were seeded into a double elimination bracket. The field of teams this year was very competitive, with seven of them being Police Softball Majors teams. We had to change the schedule a little and play as many games as possible Saturday, to miss the thunderstorms on Sunday. All teams were down for the marathon on Saturday and we ended up getting all games played before any storms came. Coming out of pool play, the defending Saint Louis Champions, Great Lakes Lawmen, earned the top seed in double elimination. There were some big upsets in double elimination play, with Louisville Metro defeating Team Texas, and then Midwest Heat, for the second year in a row, knocking a Majors team (2016 – NYPD Blues, 2017 – Missouri Lawmen) out of the Championship bracket and into the drop down Southwest Airlines bracket. The first six teams that were eliminated from the double elimination bracket were moved to a separate bracket, where they played for Southwest Airlines flight vouchers. This bracket played out with Chicago Metro, after an intense and heated battle with United KC, meeting the Missouri Lawmen in the final. Missouri ended up on top, to win the flights package. Newcomer Nebraska Law, out of the Omaha area, may have been the biggest surprise of the tournament. 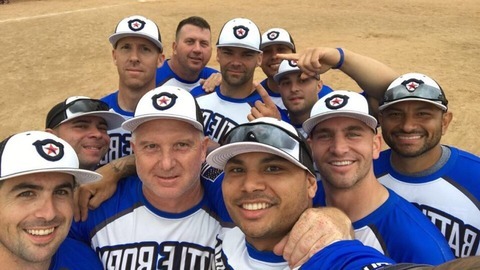 They came out of pool play as the 5 seed and ended up with wins over a few established Police Softball teams, including Louisville Metro, South Florida Lawmen and Chicago Metro. Earl Johnson said he would like to get his team to the World Series, and if that happens, the gold division will have a new contender. Double elimination played out with the Ohio Lawmen squeaking out a 22-21, back and forth game against West Coast United, to make it to the Championship game. They faced the undefeated powerhouse Battle Born, for the 2017 St. Louis Show Me Classic title. It was a close game all the way through, but Battle Born was too much for Ohio, pulling off the 24-19 victory. West Coast United and Shamrock Enforcers did a great job battling all weekend, winning some tough games, to take 3rd and 4th places respectively. I would like to thank the staff at the Bridgeton Municipal Athletic Complex, for all their hard work throughout the weekend. There were several others who helped make this tournament a success, and who deserve big thanks… Dan with Dynamac Sports Gear, Jason with Miken/Worth, Brian with PBR St. Louis, Tim with Summit Distributing, Doug with Grey Eagle Distributors, Jason with Lohr Distributors, Dan with Dr. Pepper/Snapple Group, all of our generous sponsors, Brad Johnson and Skylar Monnig. Also, thank you to all the coaches who brought your teams to the Show Me Classic, I know how hard it is sometimes to get players together to travel, and without you guys this tournament could not have happened. Finally, congrats to Battle Born on a hard fought victory!